Story courtesy of The Boot. 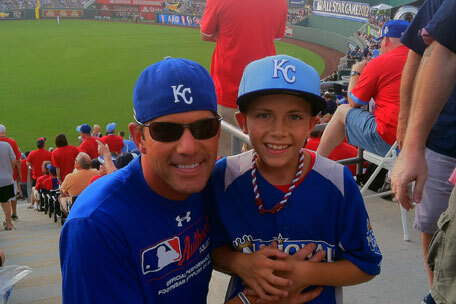 This week, Rodney Atkins is getting in some bonding time with his son Elijah, and enjoying America's favorite pastime. The pair are in Kansas City for the 2012 Major League Baseball All-Star Game, which takes place tonight (July 10). They started the week off right, though, with Elijah shagging fly balls during yesterday's (July 9) Home Run Derby. "This is the second year for him to do this," Rodney tells The Boot. "The whole thing is like the CMA Music Fest. We have seats for the game, but during the other activities we get to meet the players and some of the other people involved in baseball. It's a great experience and a great way to celebrate baseball at its half-way mark of the season." We caught up with the singer backstage during the final stop of the Country Throwdown tour Sunday (July 8) night at the Woods Amphitheater at Fontanel just outside Nashville. Rodney, who performed on several of the tour's dates, was only attending this stop, since he didn't think he'd be back from his European tour in time to perform. Elijah joined his father at the event, but the little leaguer was really anticipating this trip. "I coach his team, and next weekend we're going to State," Rodney beamed, while Elijah stood by with a huge smile on his face. It's obvious where the little Atkins got his love for the sport. "I played baseball in college," the singer added, revealing he spent his share of time on the pitcher's mound. "I like to give the boys tips and everything." When asked the best tip his dad had shared with him, Elijah thought about it, but couldn't come up with an answer. Perhaps, Pops has given the team too many from which to choose. Read the full story on The Boot.